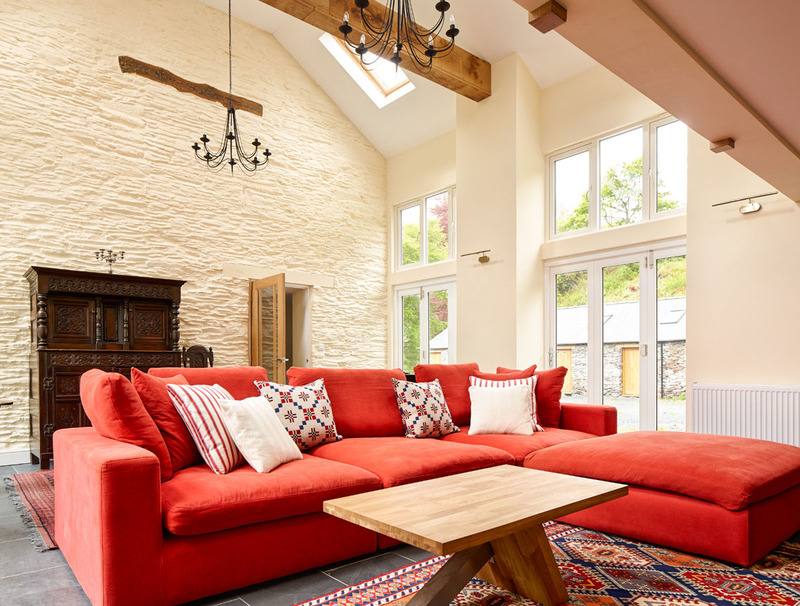 Built in the 1700s and renovated to the standard of a luxury home from home, this traditional Welsh longhouse is the perfect spot for a relaxing country break. Situated in the Dovey Forest in the southern part of Snowdonia National Park, it’s also a great base from which to explore one of the most popular travel destinations for outdoor activities in the UK. Walkers will be spoilt for choice, with picturesque routes including part of the Wales Coastal Path accessible from the doorstep, while the area is also great for cyclists. Crabbing at Aberdovey beach, train rides to Aberystwyth and visiting local museums and art galleries are other popular activities, while the cosy red Aga and wood burners at Maesywerngoch are a pleasure to return to in the evening. 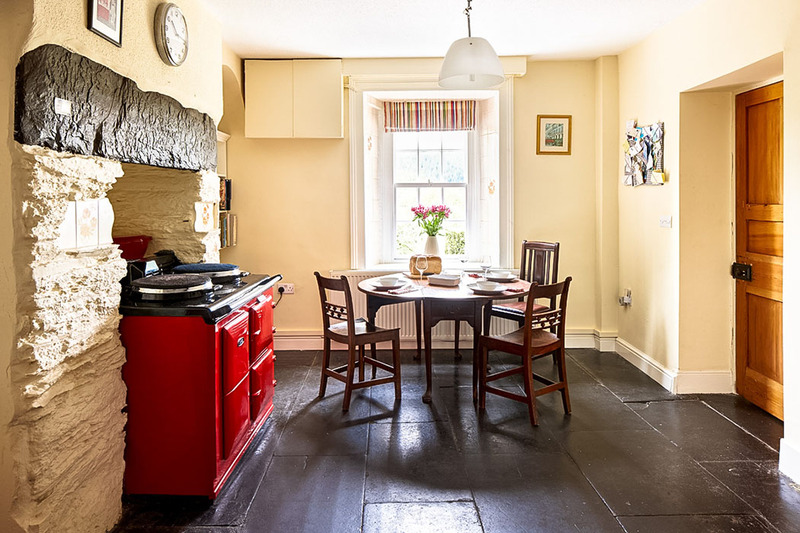 Renovated and extended to create a spacious, luxurious family house, Maesywerngoch nevertheless maintains many of its original 18th century features, such as wooden beams, slate floors and thick stone walls, all of which add delightful character to the property. Three living rooms, all with wood burners and plush sofas, and two with flat screen TVs, provide ample opportunity for chilling out, while the spacious open plan kitchen and dining area features floor to ceiling glass doors through which you can enjoy picturesque views of the gardens and valley as well as some amazing bird watching from the dining room. 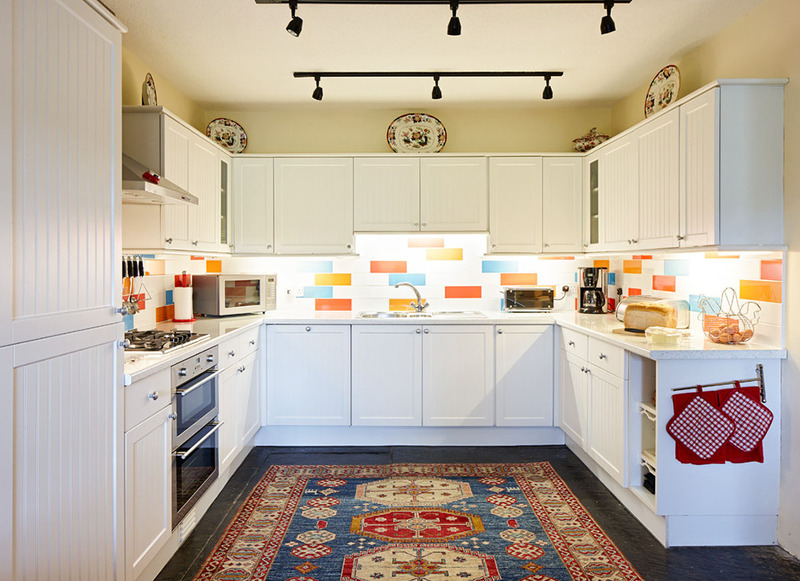 The red Aga in the kitchen is a lovely feature of this property, and many guests enjoy using it to prepare delicious home-cooked meals – Welsh lamb from the local butcher is a good choice! Handy tip – don’t worry if you’re unaccustomed to cooking with an Aga as there’s a comprehensive manual in the kitchen! 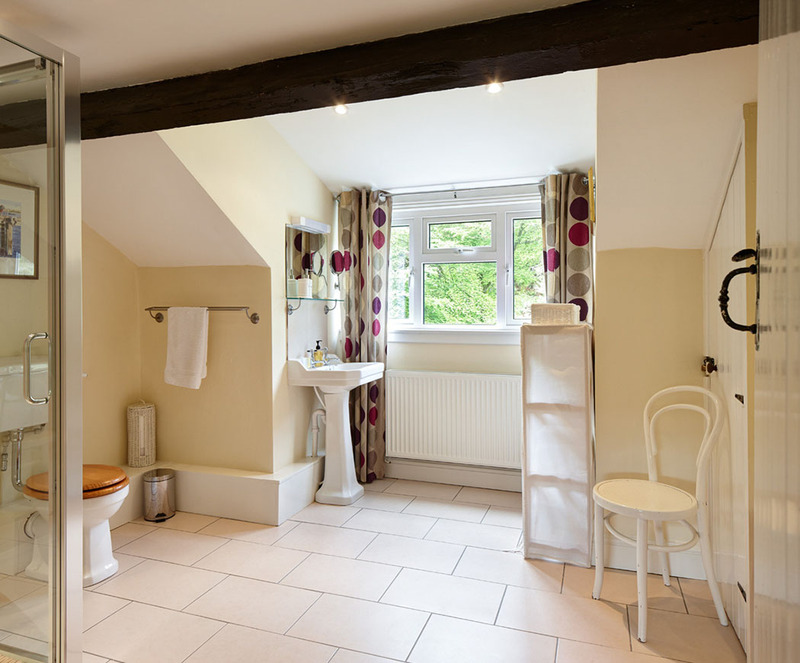 With 6 bedrooms and 5 bathrooms, two of them ensuite, Maesywerngoch can comfortably sleep 12 people. 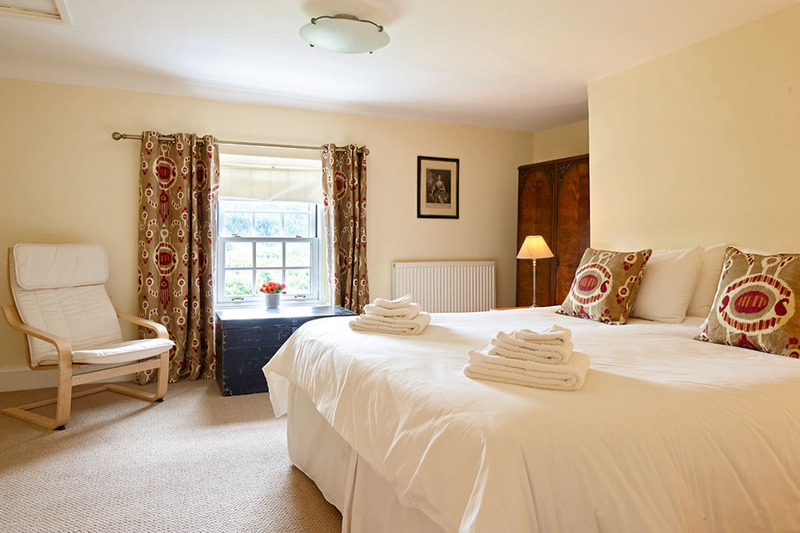 Ideal for big family get-togethers, the bedrooms provide a combination of king size, twin and bunk beds as well as a cot in the large master bedroom and an additional travel cot. 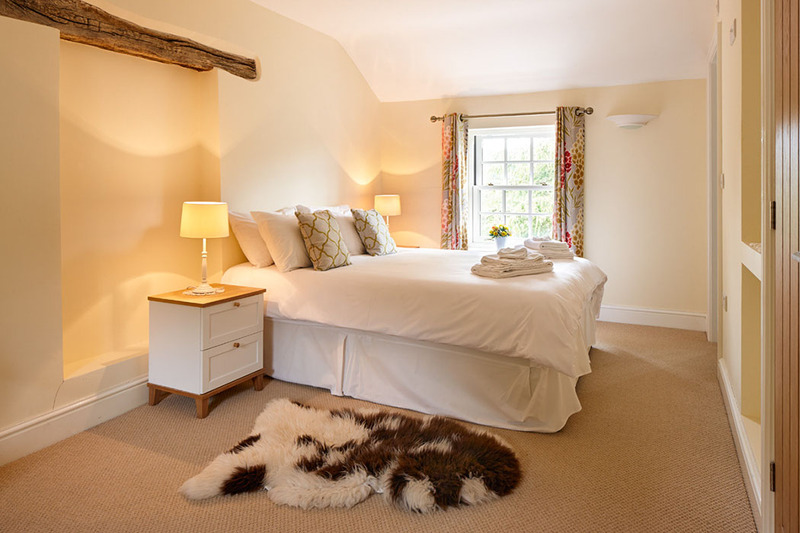 All rooms are cosy and comfortable with a home from home feel, and the standard of furnishings throughout is very high. 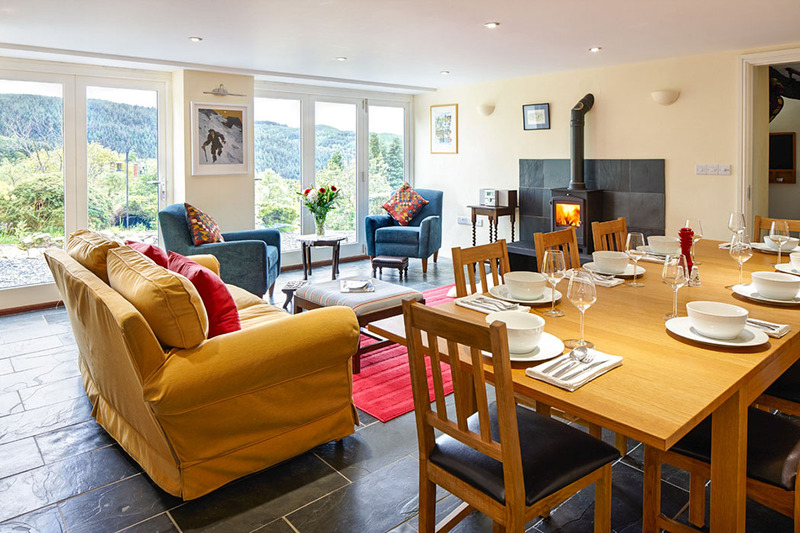 With the inviting kitchen and spacious indoor and outdoor dining areas, self-catering is one of the joys of a stay at Maesywerngoch. However, there are plenty of choices in the local area when it comes to eating out, including bistro Number Twenty One, considered the best restaurant in nearby Machynlleth. For a delicious Sunday roast, try country pub The Black Lion Inn in Derwenlas, while the fish and chips at Hennighans Top Shop in Machynlleth were voted the best in Wales in 2014! The Riverside hotel, a family run country pub with a superb restaurant, is just 10 minutes away and is an ideal choice for eating out. For anyone fond of the great outdoors, there is no shortage of things to do in the local area, with the beautiful Snowdonia National Park right on the doorstep. A paradise for walkers and cyclists, the whole family will enjoy getting out and about in such lovely surroundings. Children will love being able to pick blackberries on the many path walks, and even dogs (more than welcome at Maesywerngoch!) will have a great holiday here, with so much open space to run around in. You can find out about local history at the Owain Glyndwr centre in Machynlleth or visit the Museum of Modern Art (MOMA), while the train ride to the seaside town of Aberystwyth passes through some pretty countryside and the destination is well worth the trip. Powis and Caernarfon castles are both within reasonable distance of Maesywerngoch and each has its own beauty – the gardens at Powis and the dramatic scenery at Caernarfon – while children will love a day at Aberdovey beach during the finer weather. Crabbing off the pier and feasting on the local ice cream and fudge are compulsory! 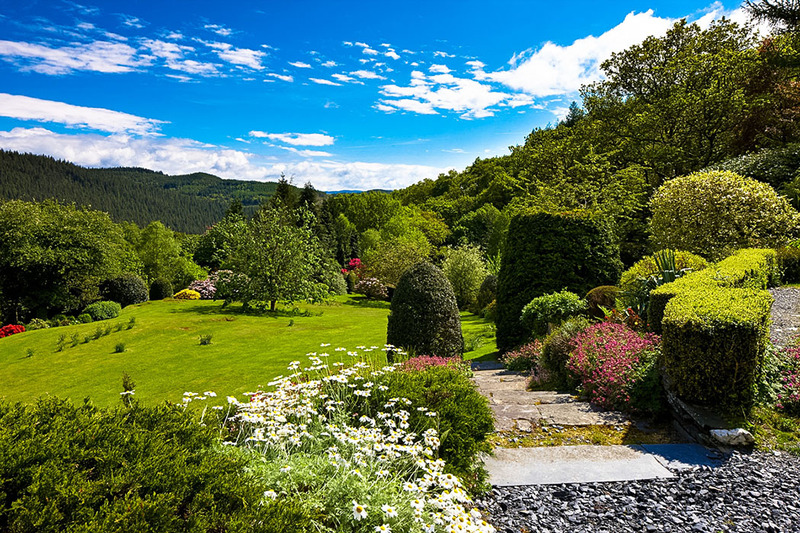 Closer to home, the gardens of Maesywerngoch offer plenty to explore. Spanning several acres, there are streams and ponds, footbridges and even waterfalls, as well as many beautiful varieties of flowers including roses, rhododendrons, azaleas and camellias. There’s even a tent provided for garden camping adventures! If the weather’s bad or you just feel like relaxing at the house, there are jigsaws, books, many board games and Sky TV to entertain you, as well as free Wi-Fi. At night, this secluded property with no near neighbours is perfect for stargazing – and there’s a telescope provided for just this purpose! This is a countryside location and it’s worth noting that there is no mobile phone reception at Maesywerngoch. There is, however, a landline at the property as well as free Wi-Fi. It is also worth mentioning that sport cars with low profile tyres will struggle to reach the house as it is in a forest. 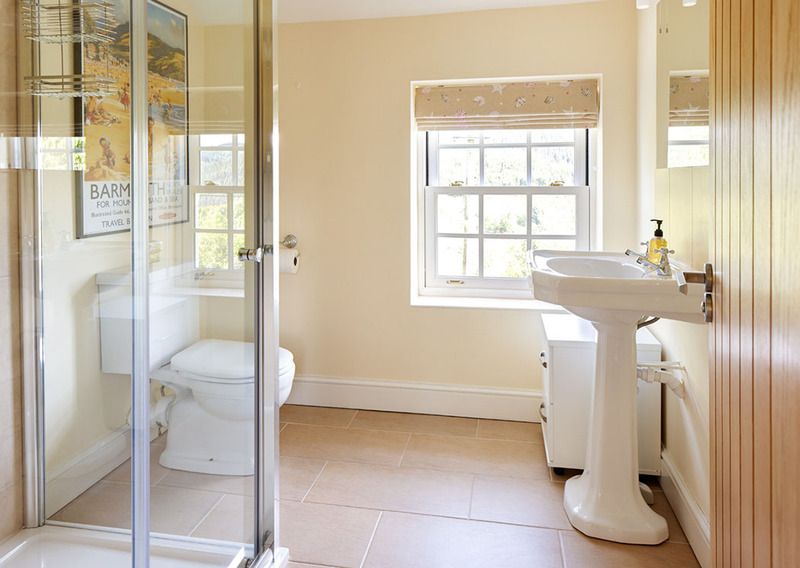 This beautiful country house is the perfect retreat for all the family.